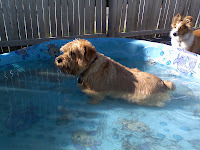 Wouldn't your dog like to have fun this summer ?? 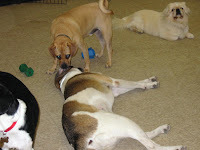 Call Susan at 508-393-6970 for a FREE daycare evaluation for your dog. 1. Every surface in the environment must be securely affixed, washable and disinfectable. None should be porous, loose, or permeable. No plaster (they'll eat it), curtains or hangings (they'll pee and vomit on them and tear them up); or ornate beds (they'll chew and swallow pieces). 2. No matter how well you supervise dogs at play, they're going to get into things they're not supposed to - so make sure there's nothing "verboten" in their environment. 3. The only objects the dogs have access to should be industry-approved toys and equipment. Beds and crates, for example must be washed and disinfected every day! 4. Toys should be examined DAILY to make sure they are not damaged or broken in such a way that a canine guest could get a piece lodged in his or her throat or intestines. For example rope toys made of string are a big no-no. 4. If it's too cute it's probably not a safe environment! Some daycare play areas, for example, include fabric hangings that can be ripped and eaten; they also hold odors, bacteria and viruses. Rubber or other relatively porous flooring also retains germs and odors and can be dug or chewed up. 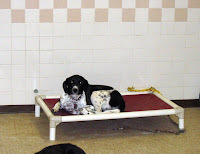 Many daycare environments are designed to charm people, but are not right for dogs. 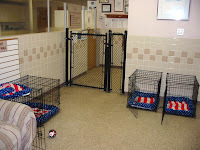 At The Doggie Den, all of our play areas are surrounded by sparkling clean ceramic tile walls. 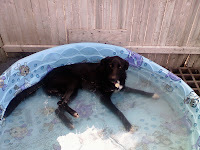 The floors are non-slip industrial pvc tiling that cannot be ripped up or chewed. 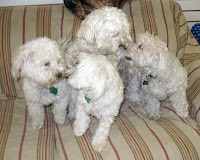 Our toys are those recommended for daycare providers by the American Pet Care Association. Our beds and crates are also industry approved. The couches in the play areas are covered by removable, washable covers and are disinfected frequently. Come see for yourself ! 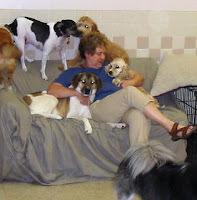 The Doggie Den is truly the best dog daycare in central Massachusetts. 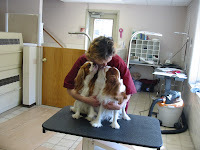 At The Doggie Den Maria grooms your dog the way you like! Tell her what you want and she'll do it! Our prices are all-inclusive: a high end, all natural shampooing, a blow-dry, a haircut to your specs, trimmed or filed nails, and clean ears. 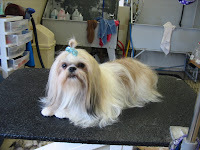 For example meet Roxy, a lhasa apso that a customer brought to our salon all matted and messy. She was too embarassed for us to photograph her in that condition! 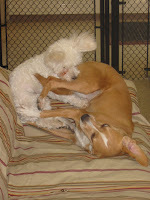 The customer had been ill and unable to brush Roxy, so she needed Maria's help. Maria patiently dematted. bathed, conditioned and brushed Roxy's coat; and here's how she looked when she went home! And here he is, ready to go home! 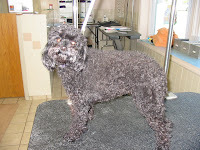 (There's more light in the "before" picture, so it looks like a different dog from the "after", but it's the same guy!) Notice how much more self confidently he stands once he looks like a pro! So would your pup like a makeover? Of course he would! Give us a call: 508-393-6970. Today I was at the bank and I saw a young man walking a fidgety black lab puppy from the bank across the blacktop to his car. It was about 90 degrees outside with bright sun beating down on the blacktop all day. I reached down to touch it and it was too hot for me to put my palm down flat. Imagine what it was like for that puppy!! And his owner was disciplining him for resisting. This is one of my PET PEEVES. I know it's unintended cruelty but it still makes me crazy. July and August are months that can hurt doggie paws. Road and sidewalk surfaces get extremely hot and dogs will often not complain until their pads are actually burned. 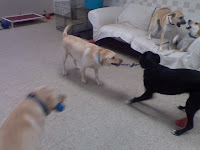 At The Doggie Den, our parking lot is blacktopped, so we recommend that customers pull right up to the door to avoid a hot trot. You might want to do the same wherever there's blacktop. Paw burns are one of the most unnoticed doggie discomforts of the summer! Blacktop is the worst culprit, so if you can find a concrete, brick or light colored stone surface to walk your dog, go for it. If you must cross hot blacktop, do it quickly! Or better yet. CARRY YOUR DOG! Never stand with your dog on a hot surface. Of course, the best solution is to walk your pup on grass or dirt where your town or city permits. And it's always a good idea in extreme temps (hot or cold) to check your dog's paws frequently. 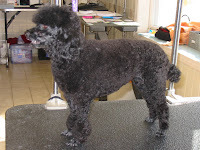 Know their usual color and look for unusually dark or uneven spots. If your dog whines, limps, or licks his or her pads after a walk, it's possible he or she has been burned. Ice down all four paws as best you can and call your vet right away!